by Dr. Patricia A. Omidian. In 1986 medical anthropologist Pat Omidian worked with Afghan refugees in San Francisco and first realized that people can find their own solutions when resilience is supported in culturally relevant ways. The ensuing years took her to Afghanistan under the Taliban, to earthquake torn Pakistan, to post-tsunami Japan, and Ebola threatened Liberia. 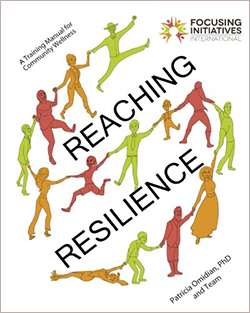 This gem of a book shares lessons she learned in over thirty years of working in diverse cultures with people and communities in severe distress. Reaching Resilience offers an easy-to-use psychosocial health approach called Community Wellness Focusing (CWF), the combined work of many dedicated community activists and healers. Each chapter explains a basic principle and gives examples of activities that support inner sensing, group learning and deep empathic listening. Focusing Initiatives International is the organization that Pat started together with social justice activist Melinda Darer to promote and support CWF worldwide.